NETWORK FINALS: All of CBS’s shows dropped in final numbers, 60 MINUTES by 0.2, GARTH LIVE AT NOTRE DAME by 0.1, and the rerun NCIS: LA by 0.1. In addition, SUNDAY NIGHT FOOTBALL adjusted to 5.4, down 0.07 from last week’s game. CABLE HIGHLIGHTS: Syfy’s compressed run of NIGHTFLYERS had a mild start at 0.15. With THE WALKING DEAD done for 2018, Freeform’s movie LIFE SIZE 2 led scripted at 0.53. Hallmark’s movie A MAJESTIC CHRISTMAS was at 0.41. Bravo’s DIRTY JOHN impressively ticked up from its premiere to 0.39 (see its unscripted lead-ins below). Adult Swim’s DREAM CORP LLC was at 0.36/0.29, compared to last week’s 0.31/0.30. HMM’s movie ONCE UPON A CHRISTMAS MIRACLE was at 0.26. Lifetime’s movie THE CHRISTMAS PACT was at 0.23. BBCAmerica’s DOCTOR WHO fell 0.09 to 0.21. On Showtime, RAY DONOVAN ticked down to 0.18, ESCAPE AT DANNEMORA ticked up to 0.10, and ENEMIES was steady at 0.03/142K. Starz’s OUTLANDER edged up 0.02 to 0.17. On HBO, the season finale of CAMPING was steady at 0.10, MY BRILLIANT FRIEND ticked up to 0.06, and SALLY4EVER dropped 0.02 off the chart at 0.03/133K. 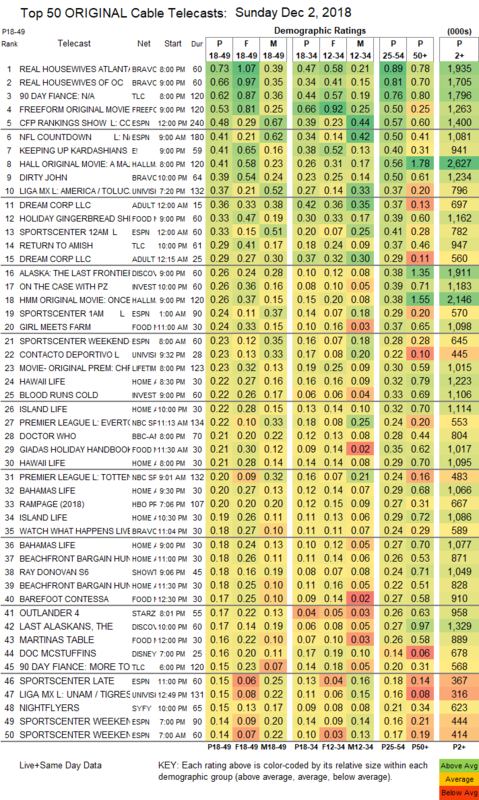 Bravo had a firm hold on the unscripted lead, with REAL HOUSEWIVES OF ATLANTA down 0.02 to 0.73, and REAL HOUSEWIVES OF ORANGE COUNTY up a tenth to 0.66. On TLC, 90 DAY FIANCE ticked up to 0.62, and RETURN TO AMISH was down 0.02 to 0.29. ESPN’s final CFP RANKINGS SHOW of the season was at 0.48. E!’s KEEPING UP WITH THE KARDASHIANS dropped a big 0.11 to 0.41. Univision’s LIGA match was at 0.37. 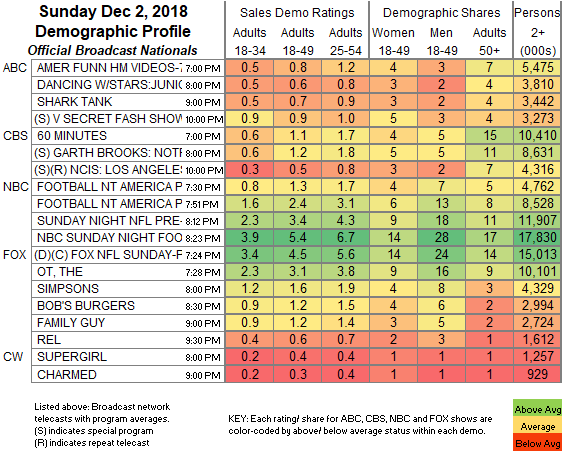 On Food Network, HOLIDAY GINGERBREAD SHOWDOWN lost 0.03 to 0.33, and HOLIDAY BAKING CHAMPIONSHIP was at 0.26. On Discovery, ALASKA: THE LAST FRONTIER gained 0.02 to 0.26, and THE LAST ALASKANS was at 0.17. HGTV’s line-up was led by HAWAII LIFE at 0.22/0.21, compared to last week’s 0.27/0.23. On ID, ON THE CASE dipped 0.02 to 0.26, and BLOOD RUNS COLD ticked up to 0.22.